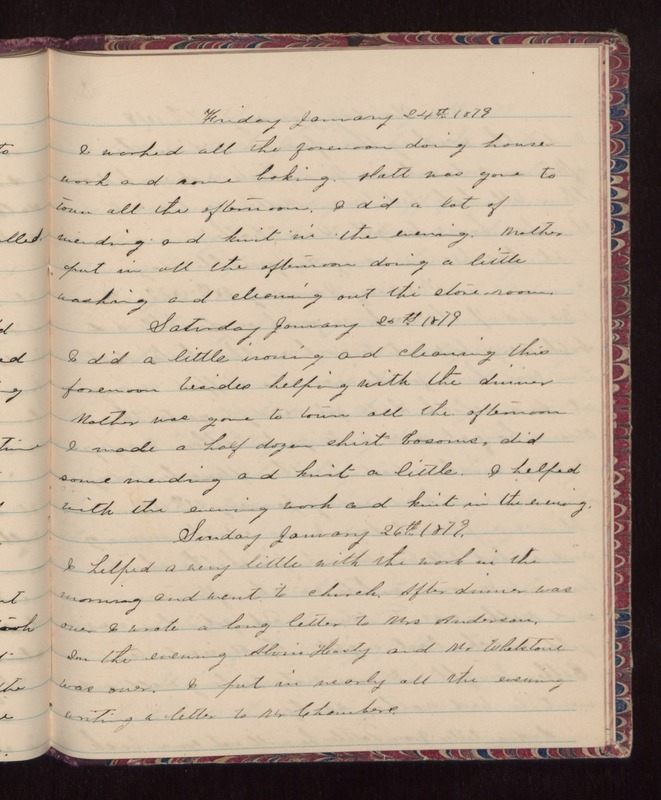 Friday January 24th 1879 I worked all the forenoon doing house work and some baking. Hatt was gone to town all this afternoon. I did a lot of mending and knit in the evening. Mother put in all the afternoon doing a little washing and cleaning out the store room. Saturday January 26th 1879 I did a little ironing and cleaning this forenoon besides helping with the dinner Mother was gone to town all the afternoon I made a half dozen shirt bosoms, did some mending and knit a little. I helped with the evening work and knit in the evening. Sunday January 26th 1879. I helped a very little with the work in the morning and went to church. After dinner was over I wrote a long letter to Mrs. Anderson. In the evening Alvin Hasty and Mr Whetstone was over. I put in nearly all the evening writing a letter to Mr Chambers.